The lotus shaped Cairo Tower was meant to impress the world as a Nasserite achievement. Piercing the Cairo skyline it would henceforth become the proud symbol for the Cairo Governorate. 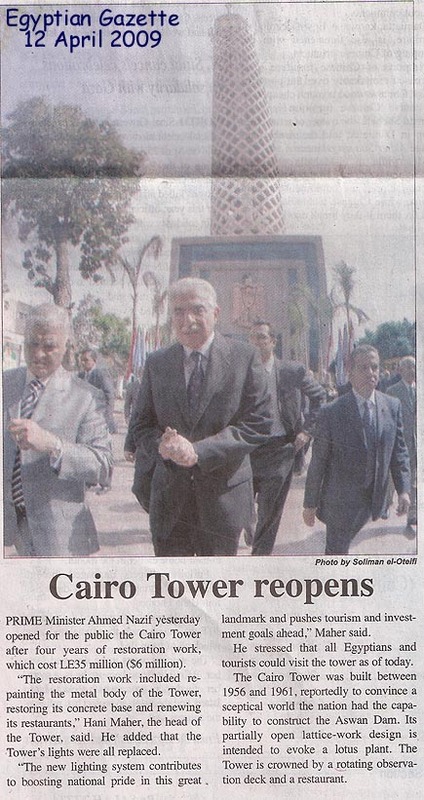 No one can blame the Egyptian administration if the inaugural ceremony of the Cairo Tower--the world's then tallest concrete structure--was a low-key affair. Without doubt mid-April 1961, when Nasser's crony Kamal al-Din Hussein unveiled the Tower's commemorative marble plaque, was a cataclysmic time. Meanwhile, in Alexandria, two self-congratulating pillars of the burgeoning Non-Aligned Movement: Tito and Nasser were having one of their epoch making summits. Likewise in Cairo things were also happening at breakneck speed. For starters the Arab League, designed by Mahmoud Riad, completed its new headquarters on Tahrir Square boasting a delegates' hall second only to the UN's Security Council. Sixteen kilometers away, on the Giza plateau, the Great Sphinx was about to speak for the first time in 4400 years marking the first Sound and Light performance. The opening ceremony was inaugurated on April 13th by President Nasser and Crown Prince (later King Constantine) of Greece. Meanwhile at the old Opera House, world conductor-composer Aram Khachaturian put the final touches to his Rhapsody Concerto for Violins to be premiered on April 20th with the presidents of Egypt and Yugoslavia in attendance. Nevertheless whatever Al Borg (Cairo Tower) lacked in architectural pizzazz and feisty inaugurals was more than compensated in print thanks to its controversial origins. The result was that the 187-meter structure was written up in countless biographies dealing with Nasser's Egypt. The first to do so was CIA's Miles Copeland in A Game of Nations where he reveals how the LE 450,000 tower was paid for with American hush money originally meant as a bribe to Egypt's strongman. The main player in this Cold War episode was Kermit Roosevelt a relative of the American presidents of the same name..
Roosevelt, then a roving CIA operative, allegedly gave Nasser's confidant Hassan Al Tohami a suitcase stacked with small bills amounting to one million US dollars reportedly to be "used for purchasing presidential security accouterments." Furious at the suggestion anyone thought he could be bought, Nasser decided to use the American taxpayers' money to send the most blatant of messages back to the US. He would build the highest structure in Cairo superseding the largest pyramid of Giza by 43 meters. It would rise from the ground like a giant middle finger so that even the Americans would see it. The tower was known in Egyptian officialdom as Waqf Roosevelt or Roosevelt's Foundation (as in Ford Foundation). Either out of ignorance or a devilish desire to sour relations even more, Arabists in Washington's State Department interpreted Waqf to mean waqef or 'erection' underscoring the malicious pun. Furious at the assumed Egyptian sleight the Americans retaliated by referring to the Cairo Tower as Nasser's Prick. The accuracy of the above parable notwithstanding, it made for entertaining and anecdotal reading. Since then journalists and authors alike could not resist mentioning the incident in their political memoirs. Unaware that the Cairo Tower was a pawn in the East-West struggle' Katherine Hepburn was the first Hollywood great to visit the tower. Despite the LE 10,000 per year concession given to Shaher Catering Co. the Tower's amenities quickly acquired a characteristic public sector look. Tour d'Argent it most certainly wasn't despite the half hour panorama provided by the revolving restaurant. "It rotated with fits and starts so that Stella beer kept spilling from your glass!" recalls EgyptAir lawyer Tamim Foda who frequented the Tower in his adolescent days. On the other hand, Foda's mother never visited the tower. "It's not due to high anxiety or anything of the sort... it's because Zamalek lost part of a unique garden to make way for someone's big ego." With the entry ticket priced at 10 piasters couples took to meeting illicitly high in the sky. The shudder and thrill of an elevator traveling towards the observation deck at the speed of three meters per second was the best thing since the roller coaster. Like the revolving restaurant, the Cairo Tower was built in fits and starts. According to its architect Naoum Chebib whose work on the earthquake-proof lotus-shaped structure was interrupted for almost three years due to the Suez War of 1956, it took five full years and 500 workers to build it. And rather than being thanked by a grateful administration, they chose instead to cut off LE 25,000 from his honorarium using the money to pay for the high-priced mosaic that decorated the Tower�s entrance. There was little the architect could do since he was one of the few who knew that the true backers of the Tower project were the mokhabaraat--secret service with whom one did not mess about. In fact this fearsome arm of Nasser's administration planned to move part of its operation in a secret three-level premise located under the Tower of which no one knew anything about except its initmidated builder. Unknown at the time, the Cairo Tower, sporting an anntena farm at its peak, had become the biggest listening post south of the Mediterranean. In April 2001 I photographed the Cairo Tower from my room on the eleventhfloor of the Nile Hilton. I took a series of images as the sun set and into the darkening night over a 40 minute period. Recently, learning how to use my computer and digital darkroom software, I merged two of the photos near the beginning and end of the sequence. I was then motivated to find out more about the history of the Cairo Tower and found your historical notes. Thank you. I attached a reduced resolution version of "Cairo at Night." - Ken Osborn (aka Mister Ken for three weeks while I was in Alexandria teaching laboratory science to the staff at the Alexandria Water Central Laboratory. I enjoyed the opportunity and the people I worked with.). Some of the world's tallest man-made landmarks: Moscow's 540-meter Ostankino tower (completed in 1967) and Toronto's 553.3-meter CN Tower completed in 1976. Both structures are taller than the 300-meter Eiffel Tower completed in 1889. The Cairo Tower measures 187 in height. Built in 2560 BC the Great Pyramid is 135.75 meters tall.